1985.5 - 1991 Km/h Gages - The same 20x21 tooth gear is used for most of the Km/h gauges. Sometimes a 20x22 tooth gear was used, but this is rare. 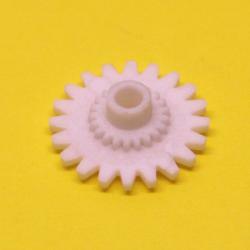 In that case, the standard 20x21 tooth gear will still fit only the odometer will read at a 3% slower rate.